Don’t miss the week-long line up of activities showcasing arts, history, and outdoor activities available in Bemidji as a direct result of the Clean Water, Land and Legacy Amendment funds. Additionally, Bemidji is celebrating legendary lumberjack Paul Bunyan’s 75th year of greeting visitors from the shores of Lake Bemidji this summer. 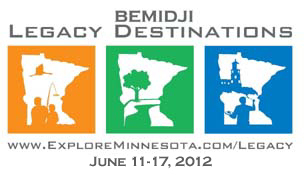 Join in the fun and celebrate Bemidji’s arts and cultural heritage and beautiful outdoors, June 11-17! For more information, contact Cindy Habedank at 877-250-5959 or visit their website. Previous postIt’s Early June; Read Northern Arts News Today! Next postArtist Talk in Park Rapids, Art Opening in Bagley THIS WEEKEND!